I had written a lovely blog post complete with charming anecdotes of all our summer adventures. I naively thought that clicking upload with send my thoughts out into the world. Sadly no. Due to the cruel gods of system crash, my blog was robbed of its latest update. Le sigh. So now begins the retelling of our summer, even though we are solidly into autumn. Logan sat out Camp Arnes last year. He was getting bored of it. This year, a friend invited him to go to Camp Cedarwood instead. I had been hesitant to send him to Camp Cedarwood because I thought it was going to be far too much money. However, I was pleased to find that it cost about the same, if not slightly less than Camp ArnesI did not know what to expect when we picked Logan up from camp, but I was blown away. This camp is insane. I want to go there. First off the grounds are absolutely gorgeous. You pull up to a 3 story lodge. It has floor to ceiling windows, a second story balcony where the kids can eat their meals if the weather is nice. The food is incredible. Logan was treated to pad thai, butter chicken, sushi, crepes.. you name it. We got to have a breakfast buffet as a parent welcome and if that was any indication of how the kids ate that week, I am seriously impressed. 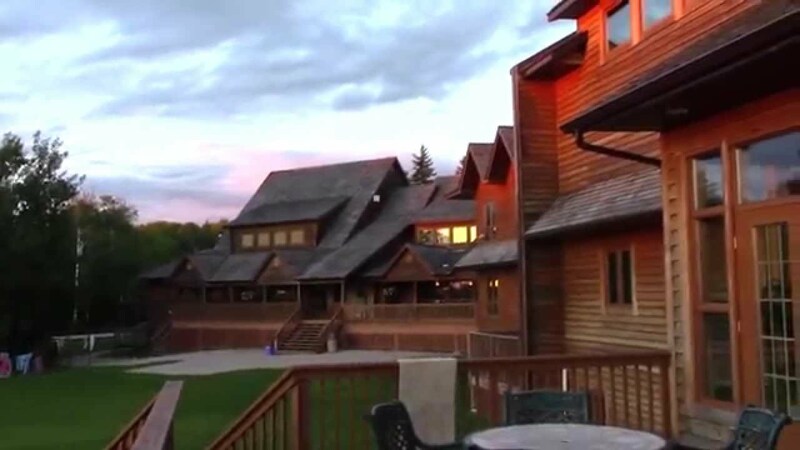 Rather than individual cabins, all of the kids stay in rooms in the main lodge, so it really does feel like a resort. There are common rooms with flat screen TVs, pool tables, black light air hockey tables which serve as both evening and rainy day havens. Add to all of this the fact that it is a teenager only camp means that they can cater all of the activities to this specific age group match their interest. The above makes it seem like this isn’t really a camp until you tour the outdoor grounds. There is a 2.5 story rope course, wakeboarding, waterskiing, wall climbing, mountain biking, a skate park, archery, canoeing and swimming which only scratches the surface of the activities they have. WOW. Logan will be back next year for sure. The first week of our holidays was spent in the city with the intent of doing day trips here and there. Logan is an adrenaline junkie and extremely persuasive, so his suggestions were the ones we mostly ended up doing. First up was wakeboarding at the aptly named Adrenaline Adventures. He had been bugging to go for days and I finally agreed. However awoke to grey cloudy skies on the day we were scheduled to go. Even with the weather being cooler, Logan could not be swayed. I called ahead and asked what times would be good as the place tends to get really busy. She mentioned that after 4 pm would likely be our best bet and they should have some openings available. Clearly she overestimated their clientele that afternoon as Logan was the only one at the place apart from one other kid who was on the rope course. The cooler weather turned into a bonus and Logan got full run of the wakeboarding course. He suited up and was chomping at the bit. The instructor walked him through the paces and before too long he was carving it up. At one point he took an EPIC face plant. I would like to say that my first reaction was “OMG is he ok?”, but 100% honestly, I blurted out a huge laugh before I caught myself. He was perfectly fine, but I did feel pretty guilty afterwards. The next day we went rock climbing at Vertical Adventures. Both boys took to it like ducks to water. I decided that I wasn’t going to be one of those Mums who watches from the sidelines, so I got suited up with the uber flattering harness. I will fully admit that I looked like a tied roast, but who cares. I should preface this by saying I have never climbed a wall before, but it looked simple enough. I started with the beginner wall. To my surprise I made it up to the top without too much trouble. My overinflated sense of self was quickly deflated once the realization that I now had to get down kicked in. I was connected to one of the auto rappel things. The instructor below told me to simply kick off from the wall. That was much easier said than done as every bone in my body was telling me to do the exact opposite. I did manage to kick off, but not far enough and slid down the wall, skinning my knee pretty good, but the battle wound served as evidence that I climbed at least one wall. I was more than content with the one wall, which I climbed a few times. Logan went on to try more challenging walls. While I was watching him climb one of the other walls, a fellow mum was standing next to me and we got to chatting as mums tend to do. At some point in the conversation she tittered that us mums were too old to attempt a wall like this. Well cr*p, at that moment I knew I was going to be climbing this wall. I am not by any means competitive, if you can run faster than me, I will simply cheer you on. However, this wasn’t a competitive thing, this was an I am not a old fuddy duddy of a mother who wears mom jeans and provides orange slices for snack kind of thing. The boys were very encouraging and so I attempted wall number 2, which was on more of an angle and thus a higher level of difficultly. Holy forearms Batman. I made it to the top and smacked the bell with my arms shaking. The mum from before gave me an impressed look as I rappelled down in a cloud of smug. The pivot point of our stay-cation and cabin week was the Twickenham Block Party. This is the third year we have had a party. It’s a legitimate event, we buy a permit and close down the street. There are events for the kids, a bouncy castle, face painting and water balloon fights. All the families contribute and we have a huge international potluck. As the sun went down we set up some sheets on a garage and made a mock shift drive in for the kids. Brad and I pulled out our kettle corn maker and I had churned popcorn. This particular day also happened to be the Mayweather fight night. As all of the neighbors were talking, our neighbour mentioned that he had bought the pay per view. Next thing I knew we were setting up some more sheets on the garage and someone pulled out their projection tv. I cannot truly put into words how awesome this was. As the kids were put to bed, the adults came out. We set up a firepit on the street and watch an outdoor version of the fight. It was beyond cool. We are going to be hard pressed to beat this one for next year. We spent the second week of my holidays at the cabin. It’s interesting how a stay-cation in the city seems to fly by, but even just a few days at the cabin seems like a longer break. I have not been able to get out to the cabin as much as I have, so it was great to see Court and Dale and catch up. I had to be back to work Friday September 1 which sucked as it meant I had to drive in for the long weekend, but whatever, no big deal. I checked the mail and found that Zach’s school schedule had finally arrived. Nothing like waiting until the last minute to send it. I opened it up and started scanning the courses and supply list. Everything seemed pretty standard, pens, binder, looseleaf… LAPTOP. What’s that now? A Laptop? Holy, I was not expecting that. Given that September is already a sh*tshow with hockey registration and equipment, back to school clothes, braces, crowns and puppy classes, I was not prepared to pay for a laptop. But, like we always so I shuffled some things around and made it work. Still, a little heads up from the school would have been nice instead of 3 days notice. The following week everyone was home. Logan didn’t start school until Wednesday. While I was at work, I got a panicked phone call. Logan had dropped his brand new phone into the sink, which of course was filled with water. I immediately told him to shut it off and dry it off as best he could. Despite what you may have heard, DO NOT put your phone in a bag of rice. When liquid enters your phone, it begins to cause a guck like substance which fries the mother board. The myth states that you are to leave your phone in rice for a few days. All that does is let the water create more guck before you ultimately take it to a repair show by which time the mother board has likely been damaged beyond repair. As soon as I got home I took Logan’s phone to a repair shop. They opened it up and got all the water out. It’s a $70 - 3 day process. After that, they try to turn the phone on. If it turns on you are back in business. Sometimes a part of two requires repair, but if the mother board is fried, get a new phone. Thankfully because we didn’t wait, Logan’s phone was restored into good as new condition. It’s a good thing because the poor kid was having a nervous breakdown. We had opted out of the insurance on his phone which would have protected us against water damage. In hind sight, not our best decision, but alas what’s done is done. But a $70 dry out was better than having to buy a whole new phone. I think that about catches you up. Hockey is about to start and much to my surprise I am really looking forward to it this year. I guess that means I have officially turned into a hockey mum. I realize I have been a hockey mum for the past 7 years already, but this is the first year I’ve really embraced it. Who would have thought? We are one of the top packers and movers in Odisha, provider cost-effective shifting solution acrosss the nation at the reasonable rate. Our services are excellent and hassle-free. Evidently nobody on the beginning entryway group, for which such a race would have been normal, seen that the door was too far back. Also, nor, evidently, did the stewards, who are horse dashing's likeness umpires. Breeders Cup 2018 Live Stream switch They decide official victors; they decide if any infractions have happened; they survey punishments to steeds and mentor and maneuvers and other dashing faculty.